Let Village Pool & Spa narrow your choices in spas and hot tubs. Headquartered in Medway, Massachusetts, we offer Softub™ & Nordic hot tubs designed for rejuvenation and relaxation at the touch of a button. Experience the luxury of having a spa in the comfort of your own home. Softub™ is the leader in innovation for portable hot tub design in making the most energy efficient affordable, comfortable and enjoyable spa on the market. Soft lightweight foam for both the structure and installation and their patented heat recovery technology, enable Softub™ users to be able to plug it into any 120V outlet to both power the jets and heat the water without a heater, making Softub™ the most portable, comfortable and energy efficient on the market. 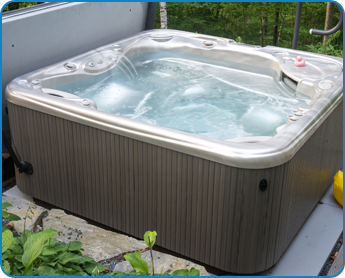 Fans of traditional lounge hot tubs will surely be delighted with Nordic's design. This brand's tubs are made of a molded shell. Each tub can accommodate 2-7 adults, which is perfect for a medium-sized family. If you want top-of-the-line tubs at a more affordable price, you can never go wrong with Nordic. Their tubs last for many years. Our owner's brother has a 12-year-old Nordic tub that still works great. We also provide complete line of pool supplies and equipment. If your equipment needs maintenance or repair, our team can handle it. We have more than 30 years of experience in the industry. A professional installer will deliver and install the tubs from Nordic and Softub.